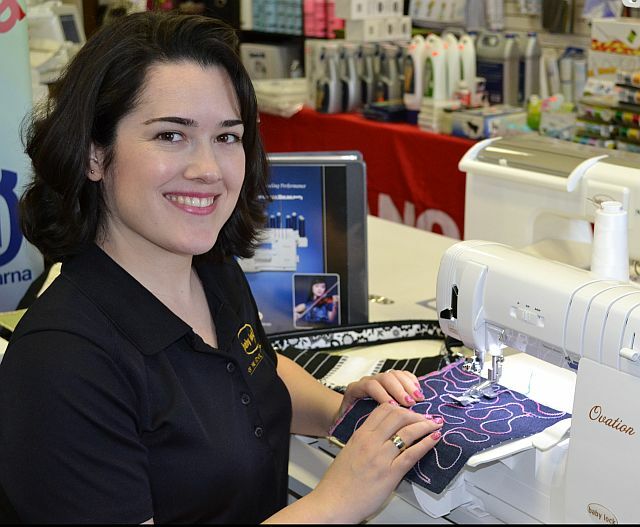 I stopped by Humble Sewing Center today to pick up Upgrade IV for my Babylock Ellismio Gold. I could not wait to get home to install the upgrade. The box contains the W2 embroidery foot, multi-function foot control, the W2 embroidery foot, a couple of screws, a bottom plate used to attach the large and small foot pedals, installation instruction manual, and Ellisimo Upgrade IV CD. LED Pointer shows you the exact needle drop position. Multi Function Foot Control that allows you to customize how the foot control functions. 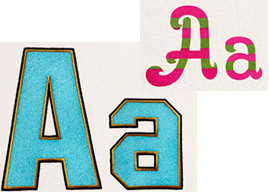 Two large 6″ Embroidery fonts. 15 Buttonholes in three sizes with decorative frames. When using the included Embroidery foot (W2), you can see the exact spot where the needle with penetrate the fabric just by touching the icon on the screen. When doing embroidery you can see exactly where the needle is going to drop so that you embroidery line up is perfect every time. 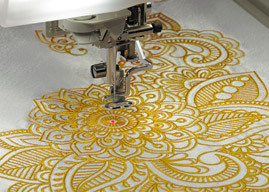 This particularly helpful to me when I use embroidery quilting designs to quilt my quilts. 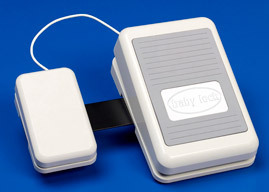 With the multi-function foot control, you can customize the functions of the foot control. You can program the pedals to start/stop sewing, thread cutting, setting needle position up or down, single stitching and reverse stitching. And, you can decide if you want to position the small pedal to the left or right of the large pedal. I positioned the small pedal to the left of the larger one. The large pedal has both a toe function which is starting/stopping sewing and a heel function which I set to raise or lower my needle. I shift my foot to the left and press the small pedal to cut the thread. I got into the habit of sewing with my left years ago. I find it easier to manage my sewing speed with my left foot. Now all I just move my foot to the right or left instead of using my fingers to cut the thread and raise/lower needle, allowing me to keep my hands on my fabric. How many times have you wished that you would you have a larger embroidery font for those extra large bath towels or a throw pillow. Now you have them. Two new large embroidery fonts are included with the Ellisimo Upgrade IV. I am going to buy some ultra suede fabric and start making some Christmas gifts shortly. Buttons make nice accents on home dec items and clothing. Large buttons are particular neat looking, but making a buttonhole for those large buttons manually is not my thing. I can never get the sides of the buttonholes to match up perfectly. Now you can make perfect buttonholes with embellishments for them. Another idea is to add a row of buttonholes when making a shower curtain. Before finishing the side hem, feed ribbon or lace through the button holes securing the ends in the finished sides. The first step in the installation is to read the instruction manual. If you follow the manual step by step the process goes very smoothly. You do need an internet connection to do the upgrade. When do the upgrade, don’t skip the step that downloads the Upgrade IV user manual. I printed the manual so that I could reference it as needed. I added the manual to my Ellisimo Inspiration Guide. Finally, it is time to use the new features. I did an embroidery with the W2 Embroidery Foot. There is a new button on the embroidery screen that shows a laser light in the needle drop position. Mark your embroidery project or place a positioning sticker on your project and press the button. A laser light shows you exactly where you needle will drop so that you can easily position the design for proper placement. I assembled the multi-function foot control with the small pedal on the left. After attaching the new foot control to the machine with two connections, open the settings to page 2. Select the desired function for the large pedal heel and the small pedal. After closing the settings, I was ready to sew with my new foot control. Wow, what a nice feature. Now I can sew, raise and lower the needle and cut the thread, all hands free. I did not have the time to stitch out a some large monograms on ultra suede to make some new throw pillows and to try out the new buttonhole designs. That will have to wait for another day. I am extremely pleased with the new Ellisimo Upgrade IV. The functionality of the multi-control foot pedal is great. I like the hands free operation. And, the laser light for needle drop down position makes it so easy to properly position embroidery designs where you are doing the first design or adding another design to an existing project. The new fonts are ready and waiting for my next embroidery project. 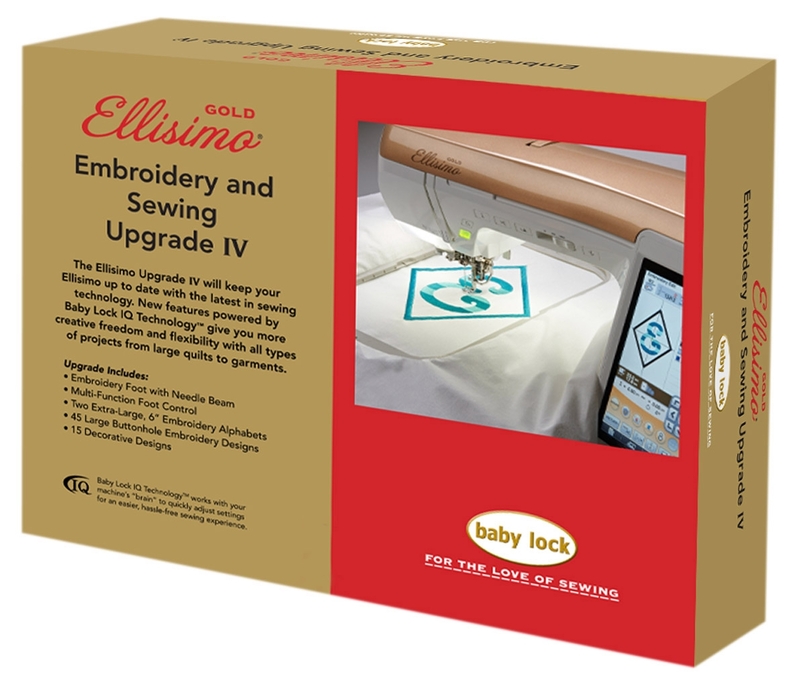 This entry was posted in News, Product Reviews and tagged babylock, Ellisimo, Ellisimo Gold, Ellisimo Gold II, Humble Sewing Center, Sew Vac Outlet on September 4, 2013 by Designs by Marje.